Chocolate love. There can never be enough variations on the theme, especially for Valentine’s Day! 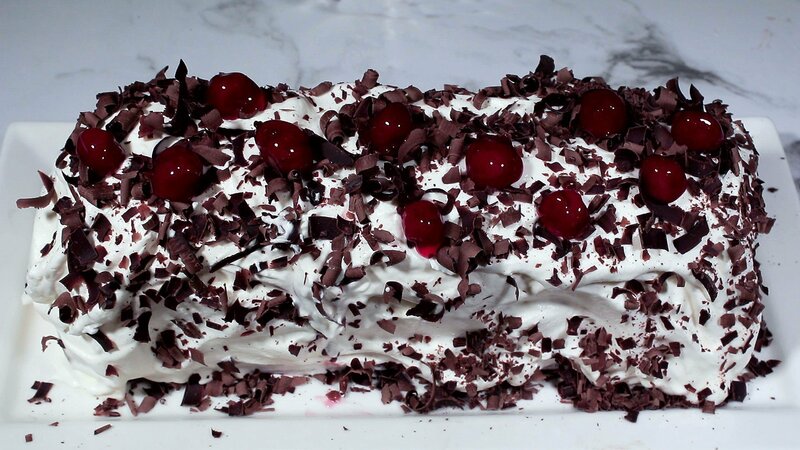 This No Bake Black Forest Cake is one of my new favorite ways to delight the chocolate lover in your life! It takes a bit of planning ahead, and don’t worry if, when assembling the cake, the layers aren’t perfect. Once the cake freezes and you enrobe the outside with whipped cream and then slice the cake, the layers of chocolate graham crackers, white chocolate pudding and dots of cherry pie filling are a gorgeous surprise! As I mentioned in the directions, if you don’t have a 12 x 4 inch bread loaf pan (which give you lots of layers) you can always use a cake pan. You won’t get the height, but the delicious, rich but subtle flavor combination of cherries, chocolate and whipped cream comes through loud and clear. If you’re looking for a new way to wow this Valentine’s Day, this cake is a stunning show of cherry chocolate love! Line a 12X4 bread loaf pan with enough plastic wrap to line the bottom and have plenty hanging over the side to wrap over the cake when layered. Open can of cherry pie filling and reserve 10-12 cherries for the top. Prepare pudding according to package instructions. Set aside. Lay 2 full sized cookies side by side in the bottom of the bread pan. Spoon a thin layer of white chocolate pudding over the cookies. Spoon about 3 tablespoons of cherry pie filling over pudding. Repeat process until you have 6 layers, ending with a layer of chocolate graham crackers. Carefully seal the cake with the plastic wrap, gently pressing the sides together to compress. (Note: Slip cardboard or cake board pieces in between the plastic wrap-sealed cake and the pan the compress even more. Place in freezer to harden for at least 6 hours. When ready to serve, beat together whipping cream and powdered sugar to stiff peaks. Remove cake from freezer and spread whipping cream on top and sides of cake. Using a carrot peeler or paring knife, scrape chocolate bar to create chocolate curls or shavings. Sprinkle over cake. Dot top of the cake with reserved cherries. Cake will take about one hour to thaw completely. Slice and serve.